Free for students and schools, Read more..
InterReg allows you to do such complex calculations just with some point-and-click. So this program is not only for mathematics and engineers. The applications are many and reach from education over science to productive use in your company: in example a meaningful sales forecast can be done in minutes. 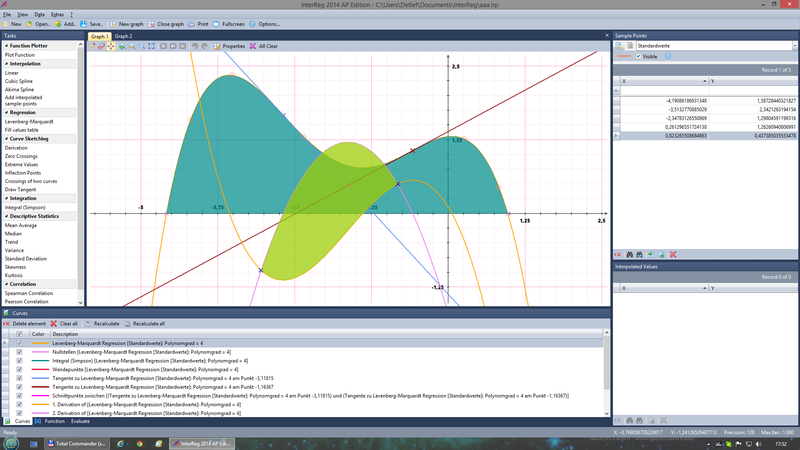 Over this, the software offers some other functionality to do curve sketching, integration and statistics as well. Without a complicated scripting language you are able to do some complex calculations with simple point-and-click. This download offers you a free 30-Day Trial Version. The program can be transformed into a full version through licensing. You can try out InterReg 2014 free of charge and without obligation for 30 days. After that you will need to obtain a user license if you wish to continue using this software. **) This license authorizes you to use the software on a single computer. There are no other costs. Free updates to all versions 2.x are included.